Oh yeah--Don’t forget the gas masks! The Gulf War had started and even though it was not being fought in Israel, the ‘Powers that be’ knew we should prepare. The appointment to pick up the gas masks had been sent. All went to the local school for an instructional video on what to do when the siren sounds. 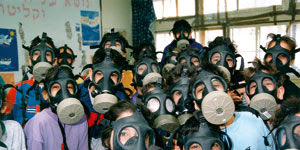 The soldiers at the school helped us learn how to put on the mask, and then showed us what to do if we believed we had been exposed to a gas attack. During school classes the teachers reviewed the procedures and emphasized to not leave home without gas masks. The children decorated their boxes and daily could be seen with the strap thrown over their shoulders as they trekked to school. Somehow this education didn’t seem to help us calm down but feel more fearful and out of control- especially the children. In The 2 Spies’ home, we let the children do all the preparations. They covered the windows with thick plastic using the brown packing tape to hold it in place. They gathered and organized the supplies and put them in the room. Then we decided who would be responsible for what tasks when the siren went off. Feeling more in ‘control’ gave them a more peaceful demeanor. And finally the siren came. 2:00 AM. We got up and got to the safe room. Each child got busy with their task. Seal off the door with tape, put a wet towel at the base of the door, turn on the radio. 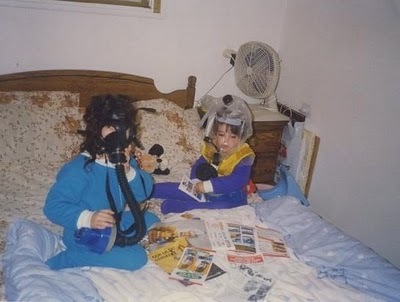 All of this done after putting on gas masks first. Sitting in the safe room the first night, I was reminded of the childhood ‘Duck and Cover’ drills and silently wondered how ‘safe’ we really were. It was rather surreal sitting there with my All-American children. Each of us looking like some giant bug and wondering where life was bringing us. Everyone was rather nervous as we did not know what to expect. And then…. We heard a song we recognized coming over the radio. “Thank God I’m a Country Boy” but in Hebrew. It broke the tension in the room as we laughed and began to sing along a little. It also set the pace for the duration. We would use humor to get through this very serious time. All in all it was an enriching experience for us all. Many, many people left Israel at the time. It did not even occur to us to leave. This is our home. At times like this, it became even more our home. The war ended on Purim and we know that Saddam- like Haman- has been brought down since then. In the end, the final analysis is that we all knew that Psalm 91 is completely true. We knew this not only because G-d is true and faithful but we experienced it ourselves. That is something we will never forget. Very eye-opening ! What you and your family have been thru just to live in your homeland. What is Your 18 Year Old Doing? Wishing You Were Here With Us!